The Large Hadron Collider is the world's largest particle accelerator and collider. 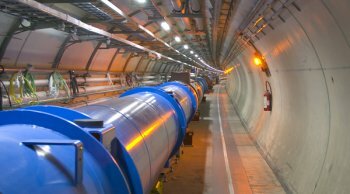 The Large Hadron Collider (LHC) is located near Geneva, Switzerland, on the French-Swiss border, and is operated by the European nuclear research organization CERN. Within a circular tunnel 27 kilometers in circumference, buried on average a hundred meters below ground, the LHC is capable of smashing together oppositely rotating beams of protons with a combined particle energy of up to 14 TeV. Acceleration of the particles is achieved using extraordinarily powerful magnets, as big in diameter as large oak trees and hollow so that the protons being sped up can pass through the middle of them. Superconductivity is the basis of their intense magnetism and this only comes into play at temperatures just a couple of degrees above absolute zero. To maintain this level of super-frigidity throughout the 1,600+ magnets spaced around the LHC's vast doughnut-shaped track calls for about 100 tonnes of liquid helium. The LHC accelerates protons until they're traveling so fast that they can complete over 11,000 circuits of the 27-kilometer-wide ring each second. Nothing must get in their way until the time is right for the two beams to collide, and for this reason the internal pressure is kept at one ten-trillionth of an atmosphere – ten times more rarefied than the near perfect emptiness on the Moon and as good a vacuum as nature has to offer anywhere in the Solar System. When the proton beams are eventually allowed to smash into each another, at one of the experimental stations located around the main ring, the result is up to 600 million collisions per second and spot temperatures 100,000 higher than those in the Sun's core. Needless to say, the LHC is power-hungry, consuming enough electricity to run 120,000 California-style homes. The four main detectors (plus two smaller ones) where collisions take place, and the outcome registered, are housed in vast underground chambers, as big as cathedrals. Two of the main detectors, called ATLAS and CMS, are general-purpose instruments that will spearhead the hunt for the Higgs boson and supersymmetry particles. The other two, known as ALICE and LHCb, will be used to study an esoteric form of matter called quark-gluon plasma that existed just after the Big Bang, and also seek clues to what happened to all the antimatter that was supposedly created along with ordinary matter when the Universe was new. The LHC will help test the Standard Model of particle physics, help probe the reason for symmetry violations between matter and antimatter, and perhaps lead to a better understanding of the weakness of gravity and the nature of dark matter and dark energy. It may also shed light on the extra spatial dimensions predicted by various forms of string theory.